TRAVEL & ENTERTAINMENT: TheatreWorks Presents The World Premiere of "Hershey Felder: A Paris Love Story"
TheatreWorks Silicon Valley continues its 2018/19 season with the World Premiere of "Hershey Felder: A Paris Love Story," written and performed by piano virtuoso Hershey Felder, who shattered box office records at TheatreWorks with his acclaimed portrayals of Irving Berlin, Beethoven, and Tchaikovsky. Now, Felder captures the life and music of Impressionist composer Claude Debussy, a visionary who proclaimed nature his religion, creating music of ravishing beauty, color, and compassion, from the sweeping �La mer� to the evocative �Pr�lude � l�apr�s-midi d�un faune� and the mystical �Clair de lune.� Intertwined with Debussy�s story, Felder for the first time shares his own deeply personal connection to the City of Light. Directed by Trevor Hay, Hershey Felder: A Paris Love Story is currently performing through May 5, 2019 at Mountain View Center for the Performing Arts, 500 Castro Street, Mountain View. 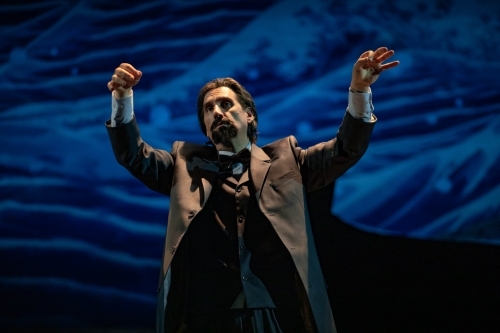 TheatreWorks will also present a special one-night-only musical event: Hershey Felder�s Great American Songbook Sing-Along 7:30pm April 22, 2019 at the Mountain View Center for the Performing Arts, inviting audiences to belt out their favorites accompanied by Felder�s signature piano stylings. From his very first performance of Gershwin Alone, it became clear to Felder that once the audience heard familiar notes from beloved classics, they wanted to join in, and thus his sing-alongs were born. The last sing-along at TheatreWorks by the adored solo performer, which accompanied his acclaimed run of Our Great Tchaikovsky, quickly sold out. Hershey Felder will take audiences through 100 years of American music from the Gershwins, Jerome Kern, Berlin, Rodgers and Hammerstein, through Bernstein, Sondheim and many more. Hershey Felder is an actor, pianist, writer, director, composer, conductor, and producer who has conjured the spirits of George Gershwin, Frederic Chopin, Ludwig van Beethoven, Franz Liszt, Leonard Bernstein, Piotr Ilyich Tchaikovsky, and Irving Berlin. Felder�s solo shows have been seen across America. Throughout the past 20 years, he has given more than 5,000 performances. For tickets ($40-$120) and more information the public may visit TheatreWorks.org or call (650) 463-1960.